The second book in the Forsyth and Hay mysteries, Not a Clue picks up where A Quiet Kill left off. What was unusual in this outing is that Ms. Brons keeps her two main characters geographically separated. Liz Forsyth has returned home to Ottawa, while Stephen Hay remains in London. Each detective is assigned a case local to their respective force. Forsyth is investigating the assassination of a young Chechen women, who was protesting at the Russian Embassy when she was killed. Meanwhile, Hay is looking into the murder of a young Canadian woman who had been visiting London, and has few clues to go on. 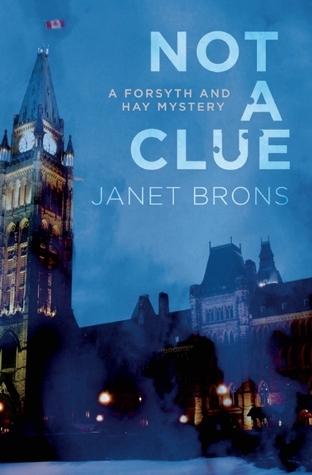 Hay’s investigation gives readers the chance to visit with the High Commissioner’s office again, and characters we first met in Not a Clue. In addition to spending time on each of the investigations, Not a Clue focused on the detective’s personal lives as well. In the course of their previous case, Forysth and Hay formed a personal connection which continues into this book. In the early stages of their relationship, the two are trying to figure out just what that relationship is. If you haven’t read A Quiet Kill (the first book in this series), I would recommend reading it before Not a Clue. I think starting with book one will give you a greater appreciation for the characters. I liked this book – the mysteries were interesting (particularly the Canadian woman’s death in London). My only complaint (which is the basis of the book) was the complete separation between Forsyth and Hay. I kept waiting for them to come together, or for their cases to intersect, but no dice. Ms. Brons does set the stage for them to reunite in the third book of this series. As I got toward the end of the book, and the remaining pages got smaller and smaller, I was worried that Ms. Brons would provide a quick and rapid solution to one of the cases, but I was pleased with the way she handled it. I’m looking forward to reading the next book. She has a knack for ending a novel and leaving the reader wanting more. Many thanks to TouchWood Editions for providing me with a free copy of this book in exchange for an honest review. Fantastic! Thank you so much for this. I’m glad you enjoyed it. I’ll be sure to let you know when the next book is out.